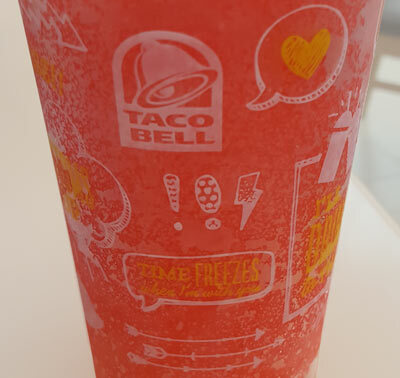 [New for 2016] Another sleepy Monday means another day of me thinking about trying the new Taco Bell freeze that was officially announced about 3 months ago. If you don't know, fruit punch flavored Rockstar Punched is pretty much my favorite energy drink... at least to my taste buds, my stomach has a somewhat different opinion, but no matter. It's Nosh Show Monday and we need something frozen to review! At least I wanted to review it, properly anyway. Unfortunately my sample is overly frozen, making it nearly impossible to drink. I walked around for 15 minutes and still only got a smattering of drinkable slush. Does it taste like their fruit punch? Yeah, I didn't really expect it not to be similar. Does it have as much caffeine? Nope, but is that really a bad thing? A 16 oz freeze still has 92 mg of caffeine plus a splattering of B vitamins (see the ingredients below). Would I recommend it? If you like Rockstar, sure, go for it. It has literally been an hour later and my cup is still almost half full. On the one hand, this product should be a good way to get that familiar flavor I like without an overload of caffeine. On the other hand, why drive to pick up a three dollar beverage when I can put a two dollar can in the freezer? (I usually pop the can open, drink a bit, then freeze the rest until it becomes slightly slushy). As far as Episode 77 goes, we have a debate about Oreos (don't we always? ), Reese's everything, sour gummy bears and a few other things. My nosh of the week is the excellent Pecan Sticky Buns flavor from Ben & Jerry's. Have a good week everyone! 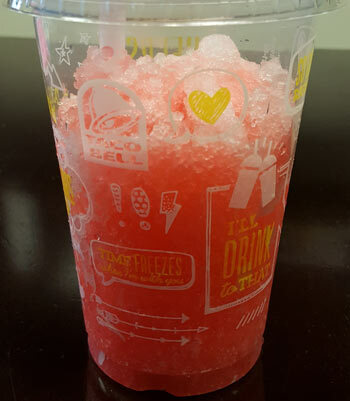 Ingredients from tacobell.com: Water, sugar, citric acid, taurine, sodium citrate, sodium benzoate (P), caffeine, panthothenic acid (B5), niacinamide (B3), potassium sorbate (P), natural flavors, red #40 (C), pyridoxine hydrochloride (B6), cyanocobalamin (B12).